Here is our first I Ain't Been Shot, Mum! 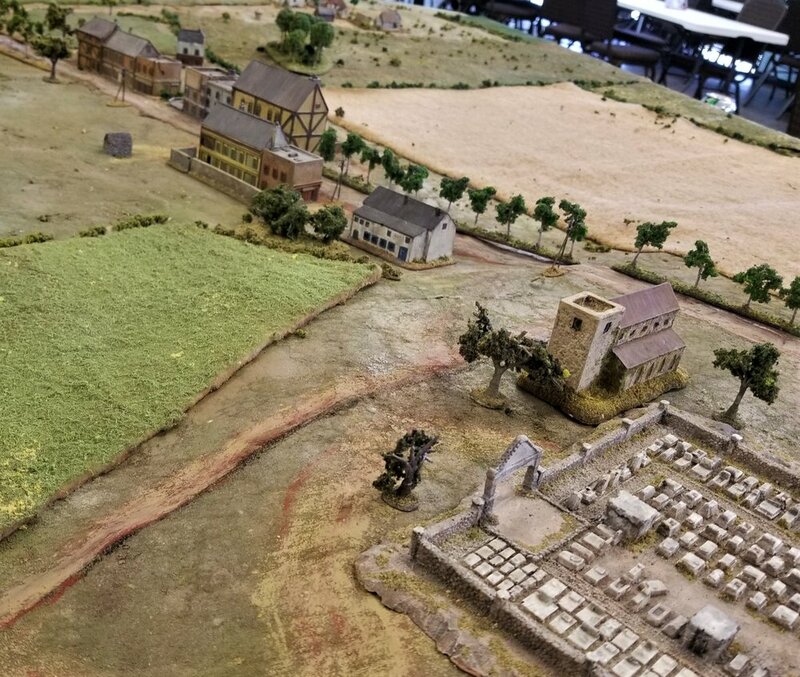 After Action Report from Jack, taken from his blog BlackHawkHet. And what an AAR it is: fully 169 photographs with a comprehensive accompanying text. It's taken me a few days just to get it all loaded up on here! Having been in contact with Jack, I'm pleased to say that the inspiration for the game actually came from VL, and from one of the other battle reports posted here. To be specific, it was from James Tree's Pushing On game, taken from the Operation Martlet scenario pack for CoC. Rather than immediately clear away the rather nice set up for the For the Honour of France game played a couple of weeks ago (click here to read the AAR, opens in a new window), I decided to use the same scenario for a game that I was umpiring between John and Dave that took place last weekend. June 1941. A most unlikely conflict has broken out between two former Allies. Vichy French airfields in the Levant have been used by the Lufwaffe to support an uprising in Iraq, and Britain has decided that enough is enough. A task force has been assembled to move north into the Lebanon and Syria to take control of the area for the Free French and safeguard British oil supplies. Unexpectedly Vichy forces resist strongly, fighting for the honour of France. That’s the introduction to the game of IABSM that Bevan and I played on Sunday evening. An unusual game featuring Australians versus French in the desert. Egg has unearthed a couple of IABSM battle reports for us all to enjoy. The first is set in Syria in 1941, and sees British troops attempting to hold a town against Vichy French attackers. Here's another after action report from Mark Luther. This time we head for France 1940, and action between the French and the Germans around Berthonal Farm, near Arras. Part of my loot from Salute: a couple of Lorraine L38 carriers. These are (badly photographed!) Battlefront models in resin i.e. come as one complete piece each and mounted on a base. Nice figures: paint up easily, and the integral base saves a lot of time. God knows if I'll ever use them, mind you, but they were half-price in a bargain box, so an absolute must buy anyway! Not quite sure why I bought these, as I don't have any Tirailleurs for French in North Africa, but I'm sure it seemed like a good idea at the time, and they have painted up quite nicely. I've now almost finished all the models I bought in the Battlefront early war sale. Here are a couple more: two 25mm SA-34 Portees for a French Escadron de Fusiliers Portees. These are fine models that paint up beautifully. Although the picture is not a particularly good one, there's some nice layering on the crew's uniforms and helmets, and you can see that the brown patches that form part of the vehicles' camouflage has come out quite well too. Over the weekend I managed to finish the first of the models bought in the recent Battlefront 'early war 3-for-2' sale: four Panhard-Schneider PT-16 armoured cars for my 1940 French army. Nice models that go together and paint up well, and should be ideal for a game I'm planning involving two reconnaissance forces bumping up against each other. Now onto the Germans. Only thing I've painted so far are some Opel Blitz buses. Very nice models that, again, paint up nicely. I really liked these, and will use them for very late war eastern front games, either as scenery or asersatz troop carriers. The picture below is a little misleading: the buses are actually quite a nice size. Finally there are some Peugeot trucks. I'm afraid I didn't like these very much at all. There were also quite a lot of bubbles in the resin. Anyway, they paint up okay, but aren't a patch on the trucks available from other manufacturers. On the other hand, they are quite cheap: £4 each unpainted. So a mixed review so far for MMModels. Lots of unique models not available anywhere else, good pricing, but variable quality (all would look fine on the tabletop though). Some Battlefront French. With the launch of the Blitzkrieg book, they brought out all these weird and wonderful units...and these are a prime example. These are Autocannon de 75mm mounted on De Dion trucks. I'm not sure how long they'll last on the battlefield, but I do love the look!